I was rather befuddled when I was asked to try out Henry's Humdingers honey with heat. My Poppaw was a beekeeper, and I'd only had honey as a sweetener like on homemade biscuits (yum). As a heat lover and honey lover, I thought these products sounded interesting. I was scheduled for the annual gathering of the Winter Grillers, so I packed a couple of jars to see what the crew thought. 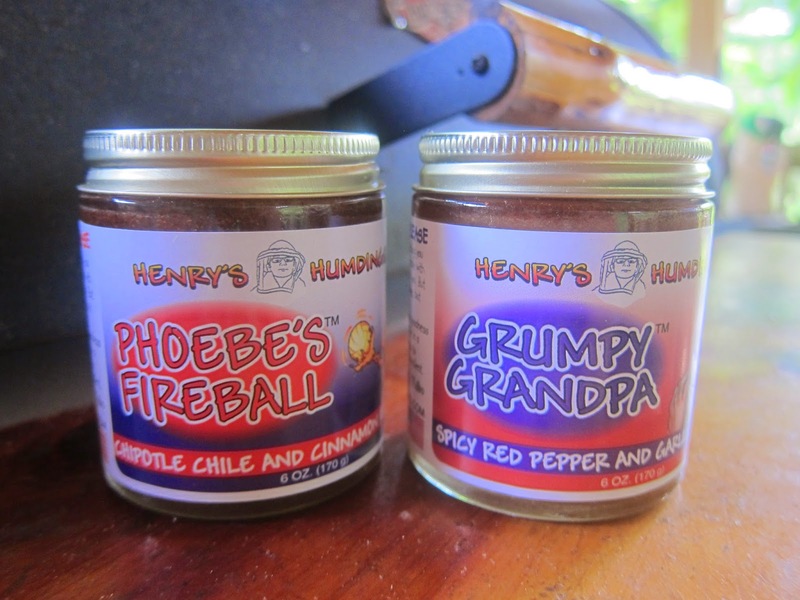 In addition to the two flavors you see above, there's also Dibolical Dad Habanero and Lime and also Naughty Nana Spicy Pepper and Ginger. 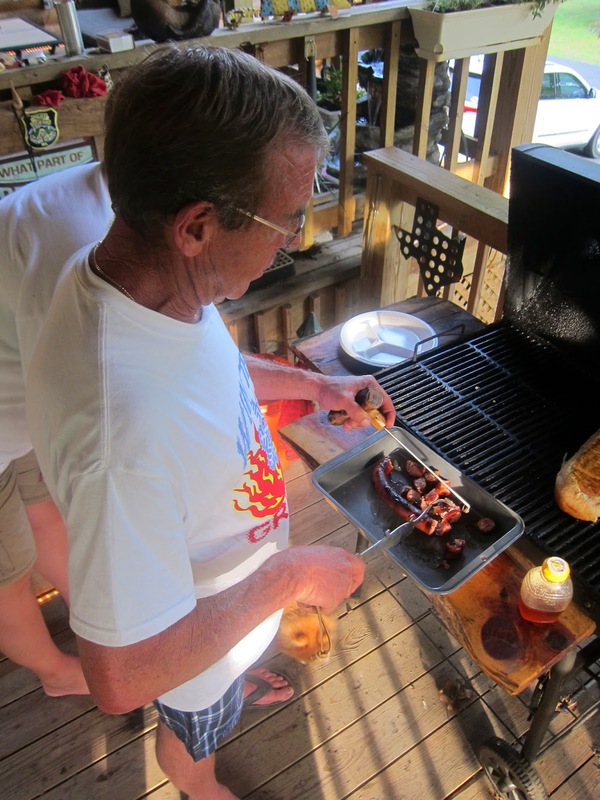 Lon is the spark plug of Winter Grillin', and he was manning the sausages. The annual meeting is at his hotel and campground Roaring River Resort in Missouri and is a terrific place to stay. You'll feel just like family except pampered. Syndi is Lon's wife, and she's a sweetheart. 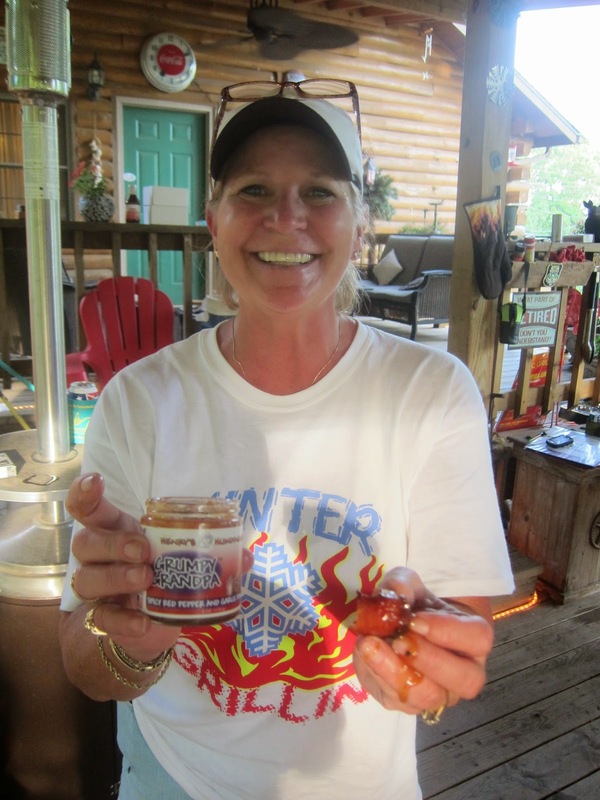 She went the extra mile with dipped honey along with the grilled on, and you can see she is still smiling. So, this honey has the spice going but doesn't have you running for the water faucet. I liked the hot and spicy honey on the sausages and also have enjoyed it on ham and even chicken. It's definitely different and memorable. My big honey eating son Eli . . . now he wasn't so happy. He likes the sweet, dark mountain honey with the comb. And, he's not a heat fan. That's okay. I keep sweet honey on hand for him. If you're more adventuresome and like heat, then I'd say Henry's Humdingers honey is a good pick. The balance of sweet and heat is solid and quite unique.